E-mail your digital photos and reports to Jim@desertusa.com. Use Wildflower Report as the subject of your e-mail. Let us know where you took the photo and the date. How to get to the park - Map - You can also tour the 133 full-sized metal sculptures here that are inspired by creatures that roamed this same desert millions of years ago. Need a place to stay? Get rates - More on the park: Park Information. March 22, 2019 John reports: These were all taken 2/19/2019 on S2 between the badlands and Vallecito County Park and Stage Station. Interesting that the blooms seemed “fresher” the further south we went while the number of caterpillars and butterflies were more numerous the farther north we went. Can’t remember a year in which so many of the hills were so much in bloom. March 21, 2019 Chis reports: The Borrego Palm Canyon area has a very nice mix of all kinds of wildflowers – some of the displays are very localized and occur only in a small canyon or grove. There are beautiful stands of yellow Parish’s Poppies at the Texas Dip area and along Hwy. 78 south of town (there are whole mountainsides covered). The only area where I found the elusive desert lily was along the S-22 east of Borrego, especially around the Arroyo Salido camp area which has a very nice lily display right now. March 21, 2019 DesertUSA reports: Wildflowers at Henderson Canyon Rd are blooming. Should reach its peak soon. March 16, 2019 Jim and Gail report: Montezuma Grade Road, several miles west of Borrego Springs, March 14, 2019, 11AM. On the drive into town we spotted a large group of cars pulled over in an area of little flower activity and figured it had to be sheep. A group of 6 rams were browsing their way up a ridgeline maybe two hundred yards or so above the road – we shot until they passed out of sight over the ridge and then backtracked up Montezuma and spotted them again on another ridge. Again, a couple hundred yards or more out but we’d come prepared with a cropped sensor camera on an 800mm lens – our standard “sheep setup”. We never did get around to flowers as the rams hung out on the second ridgeline for quite a while. March 15, 2019 Clayton reports: A cluster of desert sand verbena at sunrise off of Di Giorgio road. March 15, 2019 Marrianne reports: Many Painted Lady butterflies all over the park. This is a Painted Lady caterpillar building it's silk nest on Lupine plant in Coyote Canyon. Yellow Desert Dandelions along Di Giorgio Rd. March 14, 2019 DesertUSA reports: Lots of wildflowers off of S2 near the Carizzo Overlook and in June Wash, in the southern part of the park. The wildflowers in the Ocotillo Wells area are a little past their peak but still look good. The Henderson Canyon Road area is still a week or two from its peak. The wildflowers in the Texas Dip are still drawing crowds. The wildflowers at mile marker 31 on S22 are attracting photographers. The area off of Di Giorgio Road has fields of yellow flowers on both sides of the road. The first mile of Coyote Canyon is at or past its peak. Once you go a few miles in, the color picks up and you’ll see some beaver tail cactus starting to bloom. Pictures below. March 13, 2019 Susan reports: Photo March 12, 2019 Coyote Canyon area. March 13, 2019 Mike reports: Went to the west side of Anza Borrego Saturday down S2. Not many people which was great, I spent almost all day in one canyon (with two forks) and never saw anyone. The farther I got up the canyons and closer to the mountains there were more flowers. March 13, 2019 The Park reports: More rain! 0.37" Monday night, and the flowers that got dusty over the weekend are looking beautiful again! March 13, 2019 Stacie reports: I'm just back from a few glorious days at Anza-Borrego, and wanted to send a quick status. Arroyo Salado, the S-22 verbena, Di Giorgio road and June Wash are still all wonderful. Hellhole Canyon near the Visitor Center is also very floral, and has nice areas of some species I didn't see as much of elsewhere. Ocotillo Wells SVRA is fantastic at Devil's Slide, especially with so many very healthy dune primroses and astonishing number of painted lady butterflies. It's easy to get there by AWD, saw people going by 2WD too. The area at the bottom of the butte near the visitor center is definitely worth a visit too. Rangers can give you information on both of these. Anza-Borrego's wildflower update also mentions Blair Valley and Carrizo Badlands and I visited these. Just inside the entrance to Blair Valley is a large expanse of fiddleneck (and what I think might be an invasive filaree), but the rest of the drive to the petroglyphs is not very floral at all, it actually looks a bit early, as there's a lot of phacelia still in bud and not much else obvious. The Carrizo Badlands overlook is definitely worth a visit - the hills leading down are covered in lupine and a small yellow primrose. March 8, 2019 DesertUSA reports: The park is having an above average wildflower season. There will be a lot of people visiting to view the wildflowers this weekend. We advise you to come early, bring lots of water with you and something to eat. The south end of the park has wildflowers as well and will be less crowded than the rest of the park. See Rodney's reports for March 5 below. March 6, 2019 Anza-Borrego Desert State Park reports: Many areas in the park have great displays of wildflowers right now. Cool weather and moisture may help the bloom last through mid-March or even later. Heading east on Highway S-22, look for great blooms along the roadside and in the washes & canyons between mile 33 and 36. There is a large pullout between miles 30 and 31 with room for parking near fields of purple sand verbena. Just west of mile marker 35, park and walk into Arroyo Salado, Coachwhip Canyon, or Ella Wash. You’ll find a wide variety of flowers, including sand verbena, desert sunflower, brown-eyed primrose, desert lilies, and lupine. These flowers are blooming in response to fall storms in this area, and may be nearing their peak. CAUTION: Dirt roads into the Borrego Badlands require four-wheel-drive! In the southern part of Anza-Borrego, June Wash is reported to have nice flowers. Park near mile marker 42 on Highway S-2 and walk up the wash. The Carrizo Badlands Overlook (mile marker 52) is also worth checking, along with Blair Valley (mm 33) and various pullouts along the highway. The mouth of Coyote Canyon, at the north end of paved DiGiorgio Road, has fields of flowers in bloom. The dirt road into Lower Coyote Canyon has been opened (high clearance, 4WD vehicles only). There is room for 2WD parking at the end of the pavement. Flower seekers should walk up the dirt road for a wide variety of flowers, or explore to the EAST for a field of desert sunflowers and sand verbena. You might also find lupine, brown-eyed evening primrose, and dune primrose, as well as a few desert lilies. PLEASE RESPECT PRIVATE PROPERTY adjacent to the flower fields, and stay out of the citrus orchards. Do not drive or park on the private dirt road. South-facing slopes above San Felipe Wash (“Texas Dip” on Borrego Springs Road just north of Highway 78) have extensive displays of yellow Parish’s Poppy. 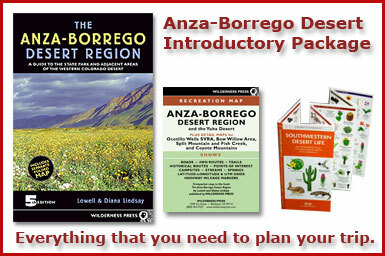 For maps and directions, visit our website at www.parks.ca.gov/anzaborrego. For updates on blooming areas, call our Wildflower Hotline: 760-767-4684. Ocotillo Wells SVRA is also experiencing an outstanding bloom due to heavy rain in the fall. Visitors with 4WD can check out The Cove, Devil’s Slide, Palm Wash, and Tarantula Wash, as well as the Buttes Pass area. Those without 4WD vehicles should visit the OWSVRA Discovery Center (near mile marker 91 on Highway 78), and walk the accessible trail to see a variety of things in bloom. 760-767-5393. March 6, 2019 DesertUSA reports: The park map for wildflower locations. Coyote Canyon Road has been opened beyond Desert Gardens, to high-clearance 4WD vehicles only. The road remains rough in spots, due to damage from flooding last month. Use caution! The Lower Willows Trail closure remains in effect. Backpackers may hike up the road into Collins Valley and Sheep Canyon. March 5, 2019 Rodney reports: Went into the south end of the park to avoid the crowds. It worked out very well. First stop was June Wash, just south of Agua Caliente off S2. (map) Roughly a half mile into wash (road was in great shape) the flowers were solid. Brown-eyed primrose and verbena dominated, but there were sunflowers, chicory and even a lone agave in bloom. Finished up at the Mountain Palms Spring Trail. (map) Tons of poppies, desert chicory, Bigelow monkey flowers, desert star and ghost flowers along with barrel cactus. March 3, 2019 Bill reports: RT S2 3 miles south Agua Caliente Campground, unmarked wash.
1. Along S22 (map) near the Arroyo Salado campground and along the first few miles of the road into the campground. 4WD recommended. Here are a few pictures with map links. March 1, 2019 Gene reports: Visited ABSP from Feb. 24th through 26th. Highlight was Coachwhip (Asclepias albicans) in flower in Bow Willow Canyon. Ghost flower just west of S2 at MM 40.2. THOUSANDS of dune evening primrose, verbena, and sunflower behind Devil’s Slide in the Ocotillo Wells SVRA (Discovery Center at north end of Ranger Station Road off 78 can give maps and directions)—I’ve never seen so many plants in flower at the same place/time. Best area for desert lily that I found was also at Ocotillo Wells SVRA, just a 15-minute walk north from the Discovery Center at the base of East Butte; some plants to 2’ tall. (Also found the mobile form of brown-eyed primrose at East Butte.) Desert lily now flowering at end of DiGiorgio Road and the road into Bow Willow. March 1, 2019 Nancy reports: Photos taken at the end of Di Giorgio Road on February 27, 2019. Feb 27, 2019 DesertUSA reports: Good wildflower display at the end of Di Giorgio Road (map). Coyote Canyon Rd is now open and the first mile is easy for any car and that's where the most wildflowers are right now. We estimate the Henderson Canyon Rd wildflower bloom is about 2 to 3 weeks from its peak. There are still lots of wildflowers along S22. The bighorn sheep are grazing along the Montezuma Borrego Hwy and eating the flowers on the ocotillos. Feb 25, 2019 Bry reports: Sat Feb 23. The end of Di Giorgio road. Flowers here are probably at their peak. Snow capped mountains were a great backdrop. Lupine and others already starting to seed. Nasty invasive Sahara mustard starting to seed, but we ripped it up! The smell of the verbena filled the air. Feb 16, 2019 Anza-Borrego Desert SP reports: 2.8 inches of rain in the recent storm has damaged roads and trails, but may very well extend the blooming season by allowing plants to continue to grow larger. Heading east on S-22, look for early blooms along the roadside and in the washes & canyons between mile 33 and 35. There is a large pullout between miles 30 and 31 with room for parking near a field of purple sand verbena. If you park and walk into Arroyo Salado, Coachwhip Canyon, or Ella Wash (map), you’ll find a wide variety of flowers, including sand verbena, desert sunflower, brown-eyed evening primrose, and lupine. These flowers are blooming in response to fall storms in this area, and may be nearing their peak. There are many desert lilies in bloom in Arroyo Salado primitive camp, with many more in bud. CAUTION: Most roads into the Borrego Badlands require four-wheel-drive! Check out the mouth of Coyote Canyon at the end of DiGiorgio Road (map), north of Borrego Springs. Lower Coyote Canyon road is CLOSED (map) to all traffic due to flooding from recent rains, but flower-seekers may walk a short distance up the road to see sand verbena. Walking along the private road heading east will take you to a field with desert sunflowers, lupine, sand verbena, and dune primrose. Feb 15, 2019 Sicco Rood reports: Coyote Canyon is flooding going through the Henderson Canyon wildflower fields, and all the way past the Borrego dump into the Borrego sink this morning. Feb 15, 2019 DesertUSA reports: Clark Dry Lake now has water and the Borrego Springs area got 2.68 inches of rain yesterday. That's a new record. Lots of water in lower Coyote Canyon – a river of water flowing through the wildflowers. Inspiration Point turnoff on S22 is flooded across the road. Feb 15, 2019 Alan reports: Visited this small wildflower spot on Henderson road (AB) during road trip around SW, first week of February . Rain ☔️ was in the forecast but the blooming was starting. Going back at end of March. RV/camping mostly gone. Going to be popular outing. You can camp nearby on public land. Feb 14, 2019 DesertUSA reports: Lots of rain in the park today. Feb 11, 2019 Patrick reports: Photos taken on S22 south of the entrance to Coachwhip Canyon on February 8th. Feb 11, 2019 Robin reports: The eastern edge of Anza Borrego along S22 is still showing nicely. I was thrilled to find several desert lilies. Sand verbena are plentiful and carpet a stretch of low hills on the north side of S22 between Thimble Trail and Fonts Point. Also in area: brown eyed-primrose, desert chickory, lupine, evening primrose, and a few yellow poppies. Feb 11, 2019 Russ reports: I spent the day (Friday Feb-8) in Anza Borrego, specifically Coyote and Palm Canyons. The attached are from Coyote Canyon. There are now large groups of verbena, dune primrose, brown-eyed primrose, desert sunflowers, and lupines. The plants are large, with lots of buds, so there's more to come. The road was very drivable, even in my Prius. The majority of the flowers are in the first 1/2 mile. Here are photos from Palm Canyon, Anza Borrego (Friday Feb-8). The flowers are just starting to bloom. There aren't large groupings, but there are plenty to see if you keep your eyes open. I took pictures of 22 different varieties. The creek is flowing from the palms all the way down to the parking lots. Feb 10, 2019 Anza-Borrego Desert SP reports: Heading east on S-22 look for early blooms along the roadside and in the washes & canyons between mile 33 and 35. There is a large pullout between miles 30 and 31 with room for parking near a field of purple sand verbena. If you park and walk into Arroyo Salado, Coachwhip Canyon, or Ella Wash, you’ll find a wide variety of flowers, including sand verbena, desert sunflower, brown- eyed evening primrose, and lupine. These flowers are blooming in response to fall storms in this area, and may be nearing their peak. Desert lilies are starting to bloom in Arroyo Salado primitive camp. Check out the mouth of Coyote Canyon at the end of DiGiorgio Road, north of Borrego Springs. Continue into Coyote Canyon about a half mile, and you’ll see verbena, brittlebush, and a few dune primrose starting. Two-wheel-drive vehicles should be able to travel as far as Desert Gardens to see ocotillo in bloom; use 4WD beyond. The Buttes Pass area also has flowers blooming. Ocotillo Wells SVRA is also experiencing an early bloom due to heavy rain in the fall. Visitors with 4WD can check out The Cove, Devil’s Slide, Palm Wash, and Tarantula Wash. Those without 4WD vehicles should visit the OWSVRA Discovery Center, and walk the accessible trail to see a variety of things in bloom. Feb 10, 2019 DesertUSA reports: Lots of wild flowers in the washes at Ocotillo Wells in Fault Wash and San Felipe wash. Here is a short video on area. Feb 9, 2019 Larry reports: These photos where taken Thursday Feb 7, 2019 at Anza Borrego. Most of the photos were taken at S22 between Palo Verde Canyon and Arryo Salado. Nice variety of flowers. A good display, but I think it will be better in a couple of weeks. Photos tips: Most digital point-and-shoot cameras have a macro function - usually symbolized by the icon of a little flower. When you turn on that function, you allow your camera to get closer to the subject, looking into a flower for example. Or getting up close and personal with a bug. More on desert photography and wildflowers photos.